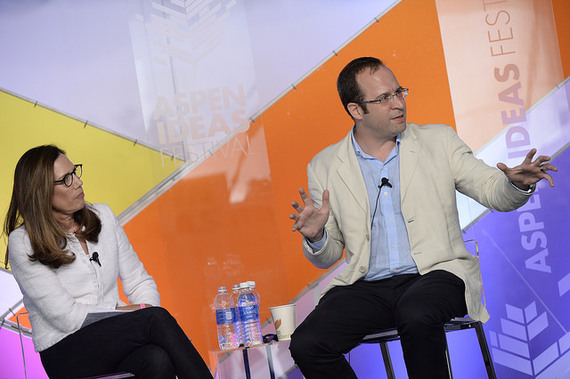 College Board President and CEO David Coleman and "Bloomberg EDU" Host and Executive Producer Jane Stoddard Williams at the 2014 Aspen Ideas Festival. When it comes to the state of student testing in the US, College Board President and CEO David Coleman said, "We are building an iron wall of inequality today into the next century." At the 2014 Aspen Ideas Festival, Coleman, whose organization develops and administers standardized tests, such as the SAT, PSAT, and Advanced Placement exams, is also the architect of the hotly debated Common Core. He discussed testing students as a measure of college preparedness, the issues of inequality and discrimination in the classroom, and the state of the US public education system. Read below for highlights from Coleman's conversation with "Bloomberg EDU" Host and Executive Producer Jane Stoddard Williams. In the clip above, Coleman explains how he's addressing criticisms that high-priced college test prep courses lead to unfair test results for those who cannot afford it. "People who defend assessment always like to say it finds diamonds in the rough, but guess what, it doesn't alone," he said. "When we worry, perhaps rightly, that assessment can discriminate, let's remember that there's another thing that we know ... that can discriminate more, which is adults," he said. In the clip above, Coleman describes an example of what happened when one school district stopped relying on teacher recommendations for determining which students would take Advanced Placement (AP) courses and exams, and instead relied on high PSAT data. WATCH: Why is it Easier to Cure Polio than Fix Education? WATCH: Can the College Board Eliminate Unproductive Anxiety?